The Cotswolds timeless quality, beautiful rolling country and charming honey coloured stone villages is the perfect backdrop to a romantic drive - away from the madding crowd. This circular route from Broadway passes a beautiful stately home, several typical cotswold hill villages, quaint riverside village, the Little Venice of the Cotswolds, an ancient Market Town, a bewitching manor house and a Folly high on the Cotswold escarpment. To drive the route non-stop would only take a couple of hours because the total mileage is 45 miles. However, to properly take in the beauty and atmosphere you will, more than likey, spend a good full day before arriving back to Broadway full of wonderful memories. Most of the route is using small 'B' roads and ungraded 'local' single track roads with passing places. Even in peak summer tourist times you will find these roads do not get very busy with traffic. 3.8 3 The beautiful romantic village of Stanton is signposted right, take this turn and enter village bearing left up the High Street to The Mount Pub. Turn into the Pub car park and back the way you came down the High Street at the bottom of which bear left and look for left turn to Stanway on Stanway Road (1.3 miles to Stanway). Very pleasant to have a drink at the pub on a warm summers evening and admire the long distance views and watch the sunset. 5.4 4 At the small Cotswold village of Stanway. If time permits spend a couple of hours going round Stanway House, the home of Lord & Lady Neidpath and at the very least have a romantic picture taken outside the very, very, impresive gate house. 8.2 5 At Hailes Abbey, if time permits get out of car and look around the Abbey ruins and also the little church opposite - nice to have a romantic picnic in the Abbey grounds on a summers day. 8.3 Continue in the same direction from whence you came make your way to the Cotswold village of Guiting Power. 13.4 6 At Guiting Power - nice pub - The Hollow Bottom, have drink or lunch and walk around this beautiful village. Continue in same direction from which you came and make you way to Naunton via the little village of Barton. 15.4 7 At Naunton we suggest you park the car in the pub car park and have a short walk through the village. 15.4 Continue out of the village in same direct of travel and make your way to Upper Slaughter. You will probably approach passing The Lords of the Manor Hotel on your left and immediately after turn right and through the ford of the river. 18.8 8 Upper Slaughter, near the ford river crossing, is popular with artists. 18.8 Continue to Lower Slaughter bearing left after a few hundred yards. 19.8 9 The village of Lower Slaughter. 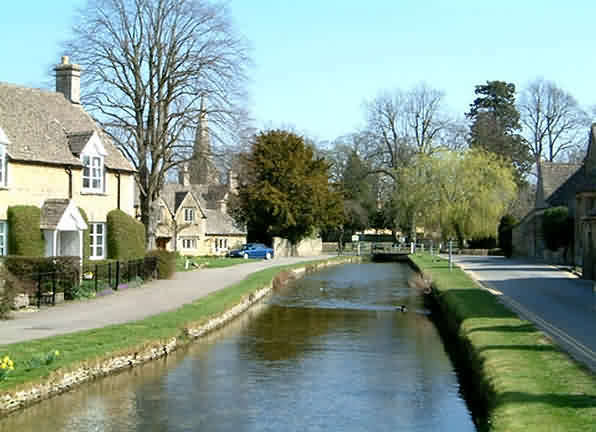 This quaint village sits beside the little River Eye and is known for it's unspoilt limestone cottages in the traditional Cotswold style. Park the car and have a stroll to the Old Mill from where you can look round or have coffee. 19.9 Leave Lower Slaughter with the river on your right and turn right at the A429 main road (Fosse way). 21.7 Turn right, signposted Bourton-on-the-Water and after approx 0.5 miles look for Car Park sign by garage on right - follow this sign by turning right into large car park. Park the car and walk the short distance into the village via alleyways signposted, Village. 21.8 10 Bourton on the Water is known as the Little Venice of the Cotswolds and is very romantic and picturesque but can get very busy with tourists. There are a number of things to see and do and at least a couple of hours can be spent here. For more information - Bourton-on-the-Water. 22.1 Rejoin the A429 from where you came from by turning right signposted Stow-on-the-Wold. 25.7 On entering the fringe of the town Turn RIGHT onto A436 [Sheep Street] and park (there is car park signposted right in about 0.25 miles). 25.8 11 Stow on the Wold is a bustling ancient market town with many shops, cafes and restaurants. Good place for a romantic dinner. 25.9 Rejoin the A429 from where you turned off by turning right at the traffic lights signposted Moreton-in-Marsh. 27.3 12 At Upper Swell, stay on B4077 (North-West) for 4.8 miles and make your way to Temple Guiting. 37.4 15 The Cotswolds hill top village of Snowshill. You can stop for refreshments at the village pub, Snowshill Arms or look round Snowhill Manor, owned by the National Trust (short distance away down the hill on the left). 39.6 16 Broadway Tower (second highest spot in the Cotswolds) - walk the short distance to the tower and admire the wonderful views over the village of Broadway the Vale of Evesham and the Welsh Mountains beyond. For more information about Broadway Tower.